Curtain Making: How To Choose The Best Fabric? So you have decided to sew new curtains for your home? 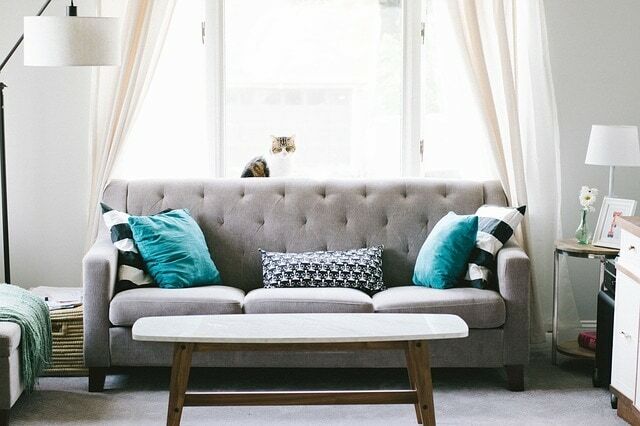 Even if you have picked the perfect color and patterns for home decor, the choice of suitable fabrics for curtains is so wide, that it could be quite overwhelming when it comes to choosing the best one for your needs, especially if you are a new seamstress. 1 What are the features to look for when picking fabric for your curtains? 2.1 So, which fabric should you choose? What are the features to look for when picking fabric for your curtains? The most important features to look for include its light filtering and insulation properties, the texture, the weight, the durability as well as how easy it is to clean. The most essential question to ask yourself is – do you want light and airy curtains, or do you prefer heavier and thicker ones? Another essential factor to keep in mind is how you plan on cleaning the curtains over time. Also, choose the fabric depending on your need for light blocking and insulation in the particular room. All of these are determined by the weave and the thread count. The lower the thread count – the less durable the fabric is, especially if it is constantly exposed to the sun. Then again, while fabrics with higher thread count are usually more durable, they often require dry cleaning which is the more expensive option for keeping the curtains clean. Overall, the most common weaves of the fabrics used for curtaining include twill, plain, damask, and satin. The plain and twill weaved fabrics are often the ones with printed patterns on them. As for the damask weave it is usually used in single-colored fabrics and provides that added texture to them. Silk is very luxurious looking, but it will very likely fade over time from the sun exposure. Thicker materials will block the sunlight better. will save you a lot of money, so you won’t feel too guilty to splurge a bit more when choosing the materials. So, which fabric should you choose? WOOL: If you are looking for a heavy and thick look and feel, then you should choose wool. Wool fabrics are perfect for those rooms which need proper sun blocking and insulation. The problem is that they are heavier than other curtains and washing them is more of a hassle than the synthetic or thinner ones. Also, wool does tend to absorb moisture, so avoid using it for bathrooms or other humid areas and rooms. COTTON OR LINEN: If you don’t need so much insulation or sun blocking you can choose cotton or linen fabric for your curtains. These are lighter and more breathable materials but their colors and patterns can fade from the sunlight over time. In order to protect them, you can fit your linen curtains with lining. SILK is probably the most luxurious fabric for curtains. It is thinner and lets more light in, but without lining, it will fade quite quickly. Silk is expensive and not so easy to wash and is not suitable for rooms where staining and splashes are likely. NYLON: For the most affordable option, you can choose nylon. Nylon is light and can be machine washed safely. It doesn’t block the light well, but if you need fun curtains for a kid’s room – nylon is perfect because you can find nylon fabrics with various fun patterns. POLYESTER: it can have tight weaves and it is lightweight. Polyester materials are more resistant to fading than natural ones and in most cases, are machine washable. You can add some lining to your polyester curtains to make them thicker and heavier. The best thing about polyester is that it doesn’t stain easily. They are easy to clean but do absorb odors easily, so avoid this type of curtains in kitchens or in rooms where there is smoking. Polyester is flammable too, so keep that in mind when picking the best fabric for your curtains. BLENDS: A good and affordable pick is a fabric which is made of blended polyester and cotton or silk. These fabrics have a high-end look and yet are easy to find and maintain. Plus, they are available in a multitude of patterns. These are the sheer fabrics which let a lot of light in the room but still provide some privacy. They are suitable for darker rooms. They are more elegant and delicate and are suitable for half curtains in kitchens and living room. If you are looking for the a lining material for your light and thin curtains, you should go for: white cotton, unbleached cotton or blackout fabric. These have a tighter weave and larger thread count than the lightweight fabrics and are suitable for second curtains which will complement the sheers on the windows. Medium weight fabrics provide more protection from the direct sunlight and from the heat and cold than the lightest ones. These are the best choice when you are looking for curtains which will blackout the room completely. They provide excellent insulation against heat and cold and are also the best if you want to ensure privacy in the room. Since they have a high thread count, these fabrics are heavier and more durable than the lighter ones. As you can see, the choices for curtain fabrics are quite a few, so always keep in mind the functionality you are looking for, the climate, the direct sunlight factor, the type of room you will be using them for, and of course the décor of the room.